You haven't arrived until you learn how to make latkes. They can be made from a variety of root vegetables and squash, but potato latkes are the most popular. Latkes are one of the most popular Jewish dishes, and a must for the Jewish Holidays. They are either a side dish or a snack. The artistry of the latke is the variety of toppings that are made for the dish. This can include smoked salmon, caviar, crème fraîche, yogurt, honey and pomagranates, gorganzola with figs and whatever your imagination can dream up. 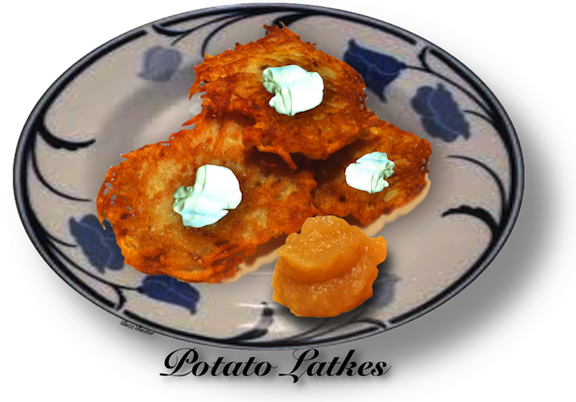 The pictured latkes are garnished with a topping of sour cream and applesauce on the side. potatoes remain in grated pieces. well on both sides. Drain well on paper towels. 5. Keep the cooked pancakes warm in a 100º F oven. 6. Serve with Pink Cinnamon Applesauce** (see recipe) and/or sour cream. 7. Makes about 2 dozen regular size or 5 dozen miniatures. or until crisp and hot. or a food mill fitted with fine disk into a bowl.) Cool to room temperature or chill before serving.